Hopefully by now you have seen previews for the NBC production of Who Do You Think You Are? This season will feature eight celebrities beginning with Vanessa Williams on Feb. 4, 2011. Other celebrities this season are Tim McGraw, Gwyneth Paltrow, Rosie O’Donnell, Steve Buscemi, Kim Cattrall, Lionel Richie, and Ashley Judd. a3Genealogy is pleased to have had the opportunity of researching for both the Tim McGraw and Ashley Judd episodes. As a guest genealogist, I will be appearing in the second episode, Feb 11, with Tim McGraw. 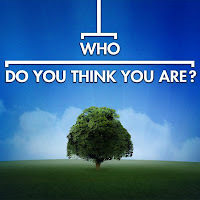 If you miss the shows, be sure to visit the Who Do You Think You Are? website for viewing of full episodes, starting with Season 1. Congrats Kathleen. I'm looking forward to Season 2 and will be looking for your episode.